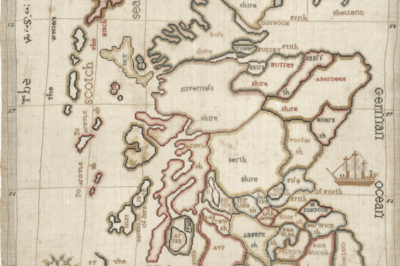 All throughout history, humans have imagined maps in different ways. The world has been portrayed as one large continent, several different continents, as population clusters, and even as humans, what is known as anthropomorphic maps. 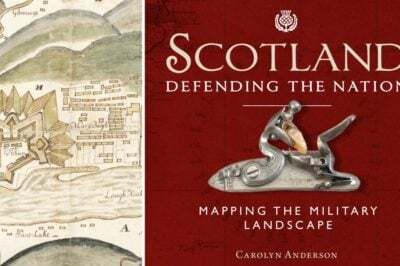 Many of these various maps and projections can be quite creative, and some of the most inventive include zoomorphic maps, or maps that portray countries and continents as animals. For the most part, these zoomorphic maps were created for propaganda purposes, portraying the world according to what point the cartographer wanted to get across. In the past, these maps typically demonstrated blatant Eurocentric ideals as they portrayed non-European countries as animals, meaning that they were uncivilized or barbarian. For instance, a recurring theme of European maps from the nineteenth and twentieth centuries depicts the country of Russia in animal form, usually as a bear. Other zoomorphic maps are associated with strong nationalistic tendencies with the creator portraying his or her country with a strong identity. For many zoomorphic maps, sometimes the animals used by cartographers play on psychological stereotypes. 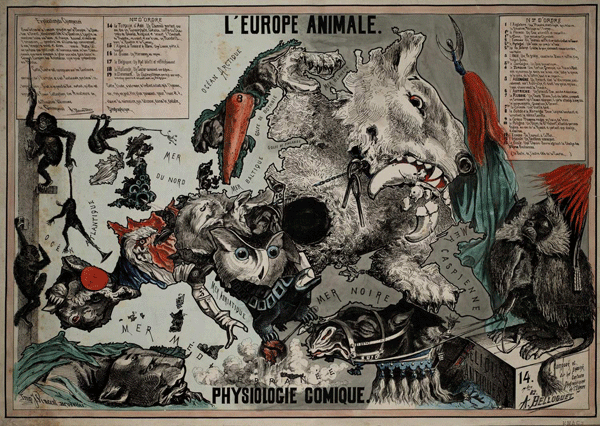 For example, a French map from 1882 portrays as a wolf-like animal crushing something within its mouth. This could be playing on the fears that Europeans had of their dominant neighbor during that time period. The same map portrays turkey as a sick horse, central Europe as an owl with large eyes, and so forth. The map also includes several monkey figures dispersed throughout. By A. Belloquet, Brussels, 1882. Sometimes, the animals used for zoomorphic maps are simply symbolic. A German map from the 1850s, one of the earliest examples of zoomorphic maps, portrays European countries and empires in symbolic animal forms. Turkey is represented, not surprisingly, as a turkey while the Austro-Hungary Empire is portrayed as a two-headed eagle, a possible reference to the dual nature of that territory in the nineteenth century. Komische Karte des Kriegsschauplatzes. Map by B.S. Berendsohn, 1854. 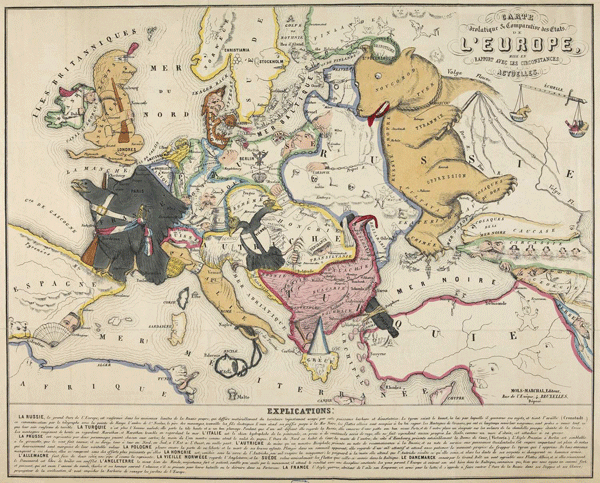 Another zoomorphic map that dates back to the period of World War I portrays Russia, once again, as a bear with France represented as the Gallic rooster. These symbolic zoomorphic maps are not limited to just those that portray the European continent, however. There is a strong tradition for the country of Korea to portray their own country as a tiger in maps. This tradition dates back to an important figure of Korean nationalism, Choe Nam Seon, who was the writer of the Korean Declaration of Independence during the Japanese annexation of Korea. The tiger has been used in maps to associate Korea with strength and courage. Sometimes, the tiger has his mouth angled upwards towards China, and, in other cases, the tiger is angled downward. The Korean peninsula has also been commonly imagined as a rabbit. In addition, zoomorphic maps have often been used for satire, similar to how political cartoons are used to poke fun at people and events. A Japanese map from 1916 satirically portrays Russia as a bear, India as an elephant, China as a large pig, Turkey as a tiger, Tibet as an ox, and Great Britain as a menacing sea creature. Political cartoons from the United States have often portrayed animals as maps as well. An American political cartoon from 1812 depicts the first Gerrymander, the drawing of electoral districts to endure victories for political parties. Map by Elkanah Tisdale published in the Boston Centinel in 1812.entitled, “The Gerry-Mander”, this cartoon led to the coining of the term Gerrymander. The district depicted in the cartoon was created by the Massachusetts legislature to favor the incumbent Democratic-Republican party candidates of Governor Elbridge Gerry over the Federalists in 1812. The octopus has been a prominent representation on zoomorphic maps. This particular animal is often used to portray countries or entities that are hungry for power and seeking to increase its influence. For example, a satirical map from 1877 depicts Russia as an octopus stretching its tentacles in every direction. During the American Civil War, a political cartoon depicted the North’s strategy as a giant snake wrapped around the southern states. 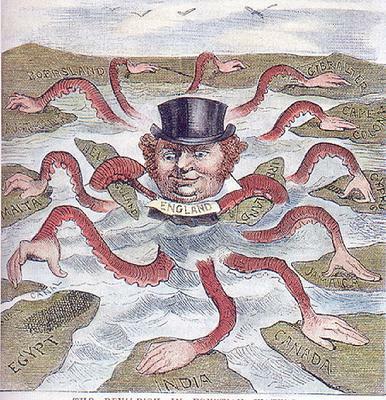 Another American political cartoon from 1888 portrayed the British Empire as an octopus with its arms in many different parts of the world. Ultimately, zoomorphic maps are utilized by their cartographers to get some point or theme across. The earliest zoomorphic maps represented the European continent and its different political situations. However, over time, these maps have also expanded to include countries and conditions from the rest of the world, and they show up in political cartoons from the United States. These Zoomorphic maps from the past have been created mainly for propaganda and political satire, and these maps achieve their purposes by using animals symbolically. “The Anaconda Plan | Strange Maps.” Strange Maps. N.p., n.d. Web. 31 Mar. 2014. <http://strangemaps.wordpress.com/2007/07/06/139-the-anaconda-plan/>. 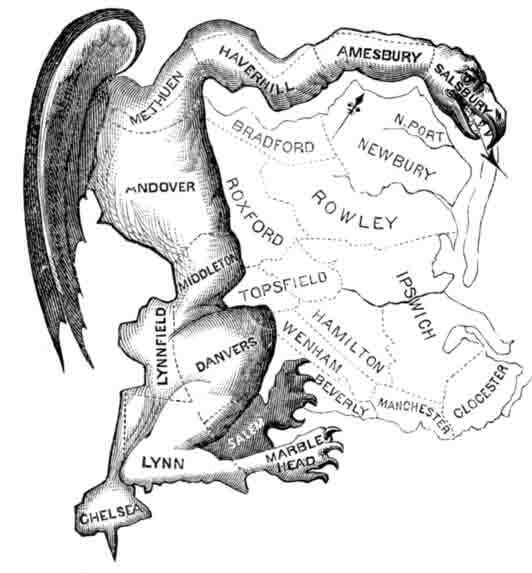 “Ever been gerrymandered? 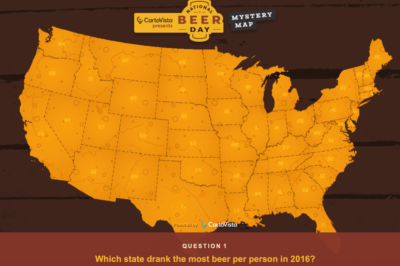 | Strange Maps.” Strange Maps. N.p., n.d. Web. 31 Mar. 2014. <http://strangemaps.wordpress.com/2006/12/18/53-ever-been-gerrymandered/>. “Maps as an Instrument of Propaganda, Part 1 | GeoCurrents.” GeoCurrents. N.p., n.d. Web. 31 Mar. 2014. <http://www.geocurrents.info/geonotes/maps-as-an-instrument-of-propaganda-part-1>. “Ways of Seeing.” : Zoomorphic Maps. N.p., n.d. Web. 31 Mar. 2014. <http://chrisotley.blogspot.com/2012/12/zoomorphic-maps.html>. “Zoomorphic Maps of Korea.” Koreabridge. N.p., n.d. Web. 31 Mar. 2014. <http://koreabridge.net/post/zoomorphic-maps-korea-intraman>. “Zoomorphism.” Wikipedia. Wikimedia Foundation, 30 Mar. 2014. Web. 31 Mar. 2014. <http://en.wikipedia.org/wiki/Zoomorphism>. “random notes: geographer-at-large.” : Anthropomorphic and Zoomorphic Satirical Maps:#2. N.p., n.d. Web. 31 Mar. 2014. <http://geographer-at-large.blogspot.com/2011/06/anthropomorphic-and-zoomorphic_16.html>. “random notes: geographer-at-large.” : Anthropomorphic and Zoomorphic Satirical Maps:#1. N.p., n.d. Web. 31 Mar. 2014. <http://geographer-at-large.blogspot.com/2011/06/anthropomorphic-and-zoomorphic.html>.